Please forgive me re the title. I simply could not help myself! 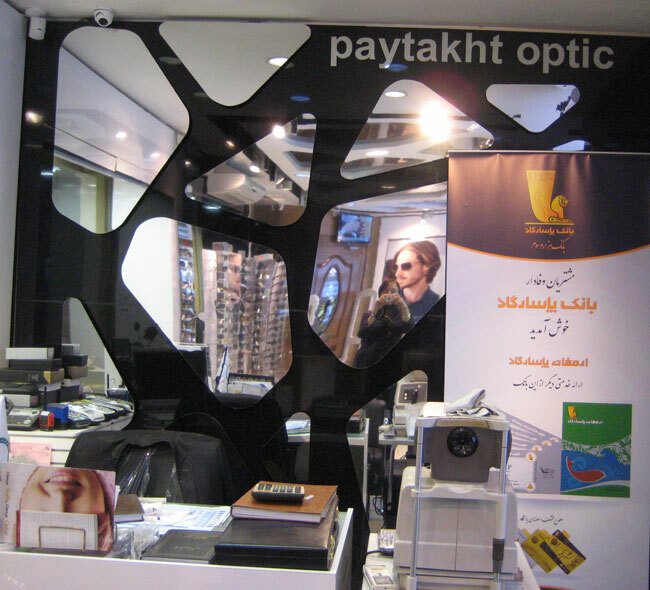 And yes, this is a post about purchasing eynak that is glasses (specifically prescription sun glasses) in Tehran, Iran. One day after coming home from work, Afooli decided she needed a new pair of prescription sun glasses, and so along with Hossein, we hopped into her car and drove to a street lined on both sides from one end to another with opticians and walked into my friend’s favorite spot. All told we spent nearly an hour there during which time Afooli — I’m chuckling at the memory of how strict and picky she was with her choice of frames — finally made her pick, choosing a super fab pair of sunglasses. Yours truly meanwhile snapped away click click click, happy as a clam. As you can see (ha, pun!) this is a story that ended productively and well. And voila: some shots for your perusal. Hope you will enjoy it and now you have an idea of what people do when they want to buy prescription sun glasses in Tehran, Iran. You also kind of sort of can get an idea of the hijab sartorial choices of women as well. Afooli pondered and checked out the selection of glasses. Other customers walked in and pondered the same as well. Someone seems to have engaged in deep philosophical pondering as well. Talk about a thousand yard stare! Penny for your thoughts, lady with lemony scarf! Couples continued to browse and shop. I continued to snap away as was my modus operandi. Click click click. BTW, I really liked this lady’s head scarf. A selfie inevitably ensued. You didn’t need an eyenak to have seen that coming a mile away! An unintentional selfie ensued as well. Success! A tres chic (seriously!) pair of sun glasses is found and begotten. Afterwards, Afooli and Hossein humored me by posing for a celebratory commemorative shot outside the store. My camera, however, didn’t humor me with a good shot. Yes, I AM blaming the camera. It was not my fault, needless to say. And let’s end on this note: this little toddler Persian girl — with her mom, waiting outside the store — who waved and smiled and I swear was the cutest sweetest little thing I ever saw. Sorry…I meant “khob” but auto-correct apparently doesn’t speak Farsi. “Eye-Nack” is one of the few Farsi words my 4 year old knows! I’m going to read this to her! Thanks for posting:).